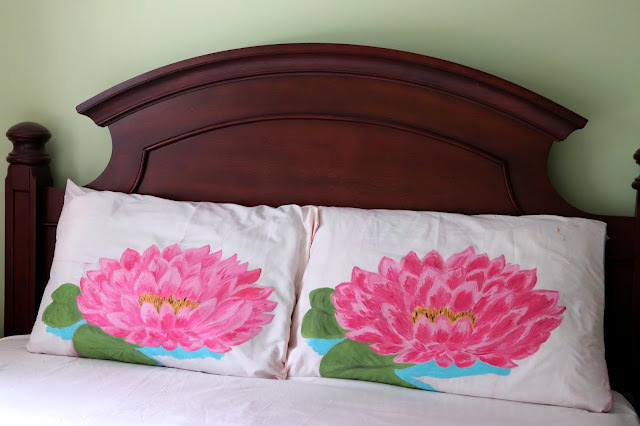 I used the steps from the book Ten-Step Drawing: Flowers by Mary Woodin to draw the water lily flowers and customize pillowcases and a bed sheet. 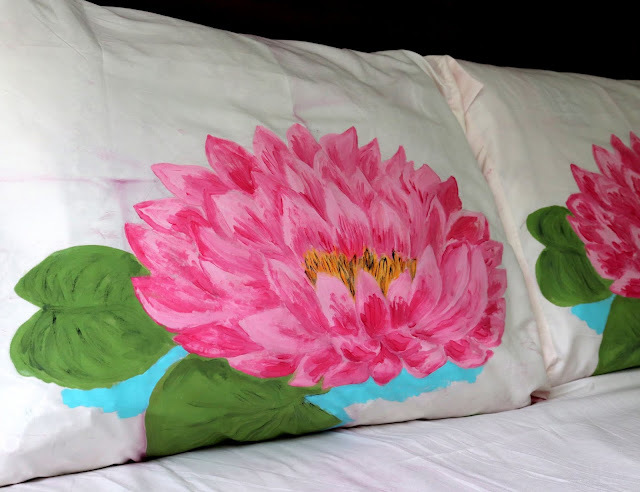 For the paint, I used the SoSoft Fabric paint from DecoArt. 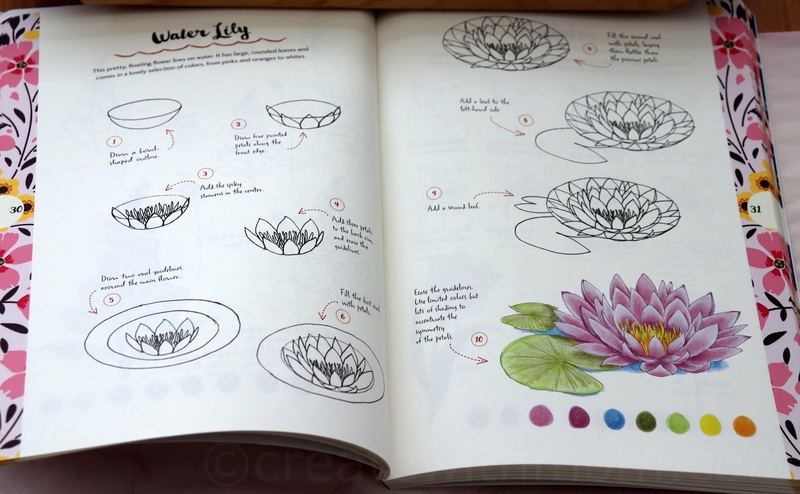 This book features illustrated tutorials for drawing 75 different flowers. 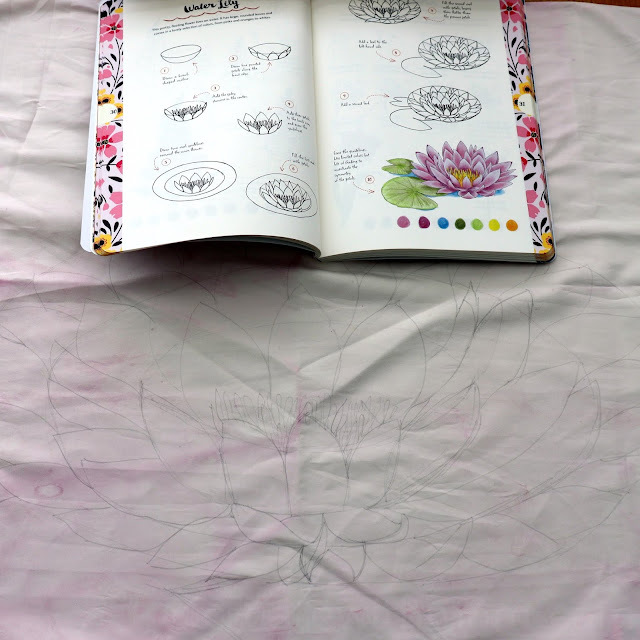 We like following the ten simple steps that is used to draw each flower. This book has inspired us to do drawings on different surfaces. 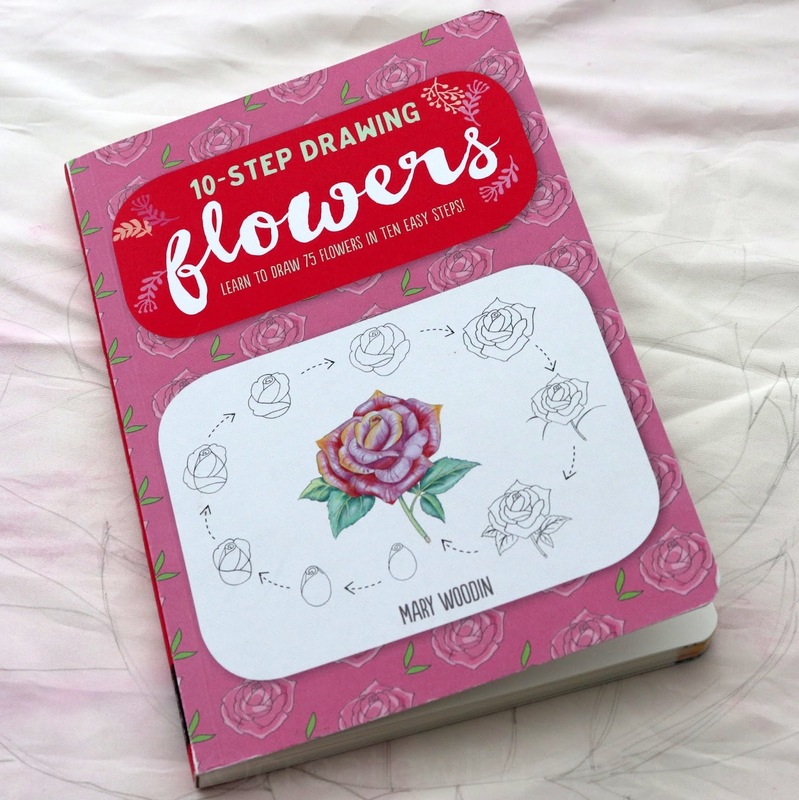 Any artist that wants to learn how to draw flowers will enjoy having a copy of this book. 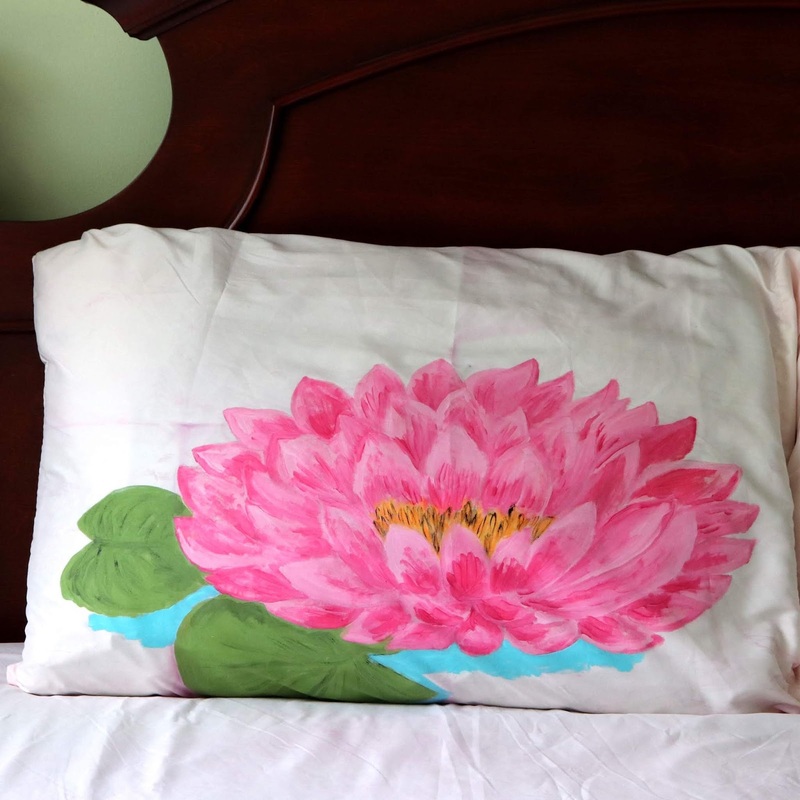 The SoSoft fabric paint from DecoArt is the softest fabric acrylic on the market. 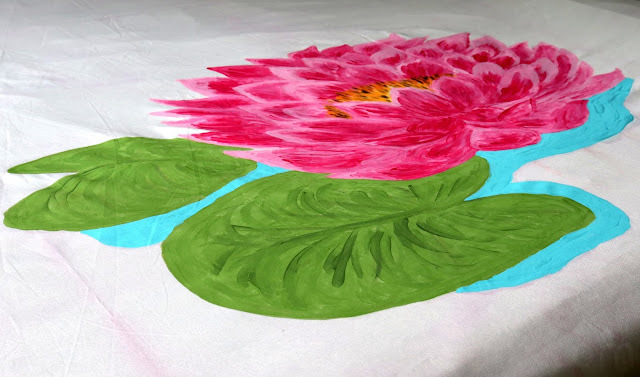 I have used other fabric paint before however, I like how smooth the paint is when applying it on to the fabric, and how quickly it dries depending on the thickness of each coat we apply. This is a permanent paint and it does not requires heat setting. Once dry, it is extremely soft and flexible to the touch. It adheres to all textiles and will not crack, peel, or harden even after repeated use and washings. 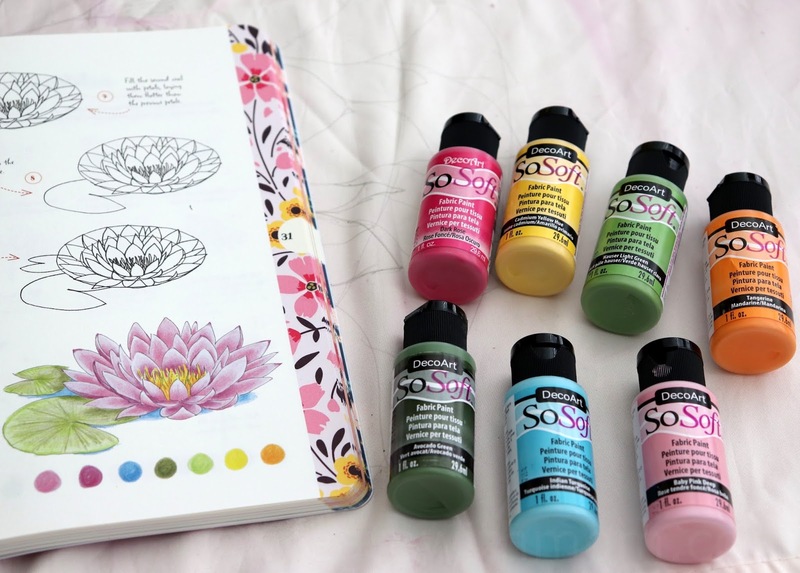 I like that DecoArt SoSoft fabric paint is available in a versatile colour palette, which we can use for our home decor and fashion pieces to give an opaque coverage. The water-based non-toxic paint is made in the USA and available in convenient one ounce bottles. Prior to painting the fabric pre-wash wearables without adding any fabric softeners. We can apply this paint with a brush, sponge, or stamp. Place a piece of cardboard under the cloth. Draw the flower to your desired size using a pencil. Once you paint the flowers let it dry completely before washing it. It needs to be kept to dry for 48-72 hours and then wash inside-out on the gentle cycle. Hang to dry or dry on low heat. Do not dry clean. I like that the painting surface can be easily cleaned up with soap and water. This hand-drawn and fabric painted Water Lily on the bed sheet and pillowcases add a personalized touch and brightens the space. All rights reserved on photographs and written content Createwithmom © 2010 - 2018. Please Ask First Disclosure: Please note that all opinions and thoughts expressed are my own. For reviews and/or sponsored posts on this site I may have received special perks as part of my affiliation. They are so unique and beautiful. I love the look. what an amazing job. looks so good. Wow that looks so beautiful! wow, this is gorgeous! Can I use puffy paints? and it will be ok to wash? I may do a Halloween one! Thank you. I have used fabric paint in this project and once the fabric paint dries in 48 hours it can be washed. This looks really good and I'm guessing you have a little talent on your side. I would never have thought to do this! wow, so pretty and unique! my daughter would be good at this! I'm going to look for this when I'm in my nearest craft store! These paintings are really beautiful. You did an amazing job and it's something that looks interesting and fun as a craft. That book is so great for this project! You did an amazing job with the flower! Oh wow so beautiful, I would never be able to do anything that nice! Where did you purchase that book? Thanks for sharing,you done an amazing job.What a great project for my granddaughter and I.
Wow that is neat, thank you for sharing this with me. Did you learn the craft from your mother? Yes I did, it was so much fun! I love the detail in the flower! This paint is so neat! So pretty - a personal touch to brighten the room. I like that the SoSoft fabric paint from DecoArt doesn't require heat setting. It's so great that the paint dries soft! So lovely...Not sure I could do it! These would make lovely personalized gifts for the holidays. These are lovely, would be such a great craft to do. Very pretty but sadly not talented enough to do something like that. This reminds me of artex in the 70's. Wow these are beautiful. I would love to be able to make these. Would make great gifts. I sure would love to try this it's beautiful !